Love is in the air because who isn't dating or married?! Let's play a round of connect the stars. Netizens still reeling from news of the Feng Shao Feng (born 1978) and Ni Ni (born 1988) breakup last year can rest assured since they each have found a significant other in the past month (bet they coordinated the release of the news). Feng Shao Feng is one of China's eligible bachelors, a fuerdai 富二代 aka second-generation rich, good looking and successful in his own right while Ni Ni is supposedly pretty amazing herself. I say supposedly because I haven't actually seen her in anything except for Wonderful Friends (a celebrity reality show taking place in a zoo). Nevertheless, the couple of 3 years seemed like a match made in heaven so their separation was much to fans dismay. 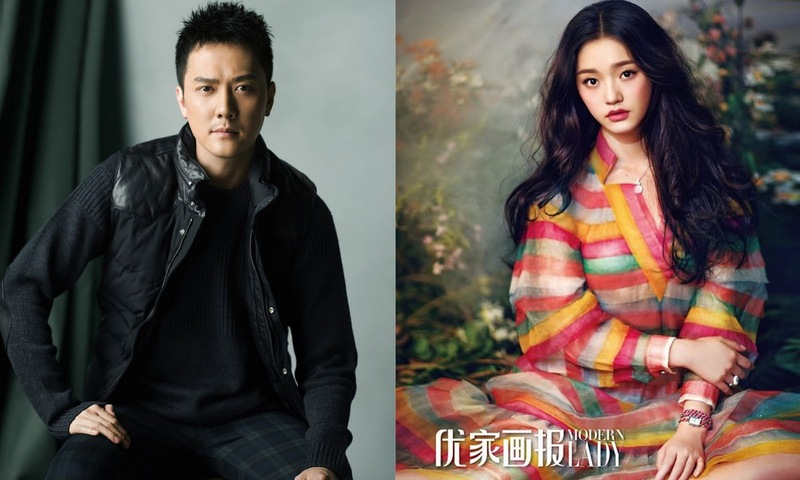 Anyone speculating that the relationship turned south due to the 10-year age gap would have to renege on those words because here's a shocker with 37-year-old Feng Shao Feng (Ice Fantasy) currently dating 19-year-old Jelly Lin Yun (born 1996). The whopping 18-year difference doesn't strike me as weird, the fact that she's a teenager does. Not to fret as Ni Ni (born 1988) subsequently announced her relationship with Jing Boran (born 1989) and both were coincidentally(?) bridesmaid and groomsmen in 2015's wedding of the year wherein high-profile couple Huang Xiao Ming and Angelababy finally tied the knot. Jing Boran was in Love Weaves Through a Millennium opposite Zheng Shuang (born 1991) who used to date Zhang Han. She has since moved on to better things, becoming a face to be reckoned with because she's practically everywhere - dramas, movies, you name it. Zhang Han (born 1984) didn't sit idly either, dating co-star Gu Li Na Zha (born 1992) from their collaboration on The Classic of Mountain and Seas. Gu Li Na Zha is the Uighur girl that literally went from unknown to starring role in Rift of the Sky, which also starred Liu Shi Shi. Having been a fan of Liu Shi Shi (born 1987), I am super happy to share her wedding shoot with real-life sweetheart Nicky Wu (born 1970). Yes, shippers' wildest dreams do come true even though it's technically Nicky Wu's second marriage after divorcing co-star Ma Yashu from his Xiao Shi Yi Lang days. 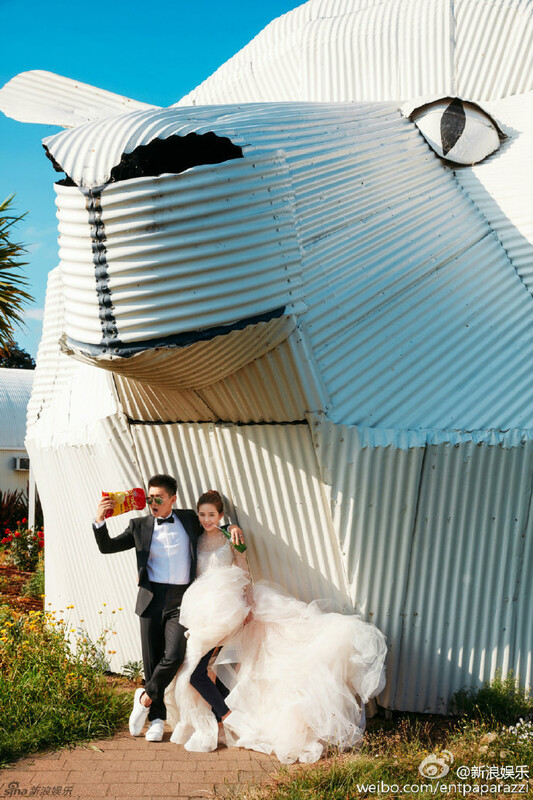 Nicky Wu and Liu Shi Shi officially wed last year, the photos came out this month and the ceremony is said to be held March 20 at Ayana Resort in beautiful Bali. Her 'sister' Annie Liu from Scarlet Heart will be the bridesmaid and the motif will take inspiration from the magnolia flower (wink wink). They definitely look adorkably blissful (more pics below). Nicky Wu was recently with Zhao Li Ying (born 1987) in Legend of Zu and rumors say that she is dating a non-showbiz boyfriend. Am I hearing hundreds of broken hearts? Zhao Li Ying was almost always linked to Chen Xiao after the pair rose to fame because of Female Prime Minister Lu Zhen and their OTP so popular that it warranted a cameo for Zhao Li Ying as Yang Kang's wife in Romance of the Condor Heroes ROCH. Their onscreen chemistry might be sizzling yet in reality, I am quite happy for Chen Xiao (born 1987) and Michelle Chen (born 1983), both of which played the leads in ROCH. They have been dating since ROCH in 2015 and netizens are anticipating wedding bells by the end of the year, Jul 2016 to be exact. Are you still following? Yang Rong has a supporting role in too many dramas (ROCH, Lu Zhen included) and I'm glad that she is breaking out of the mold to play the lead. Expect to see her in Legend of Flying Daggers opposite Hawick Lau and the love line continues since Hawick Lau (born 1974) is basically Yang Mi's (born 1986) hubby. Yang Mi is cast opposite Mark Chao (born 1984) in upcoming c-drama Three Lives Three Worlds and doh, of course he's married too, to gorgeous Gao Yuan Yuan (born 1979) nonetheless. There's no way to connect the dots with a non-showbiz person joining the fray as Zhang Tian Ai's rich boyfriend but my creative juices are flowing so here goes. Zhang Tian Ai's co-star Yu Meng Long, the 9th prince in Go Princess Go, is also going to be in Three Lives, so whaddayaknow, we've come full circle. That's awesome how you connected everyone. I still want to test out my theory of being able to connect any celebrities in the world simply by their works and or their co stars. Anyone want to throw 2 names out there? You're welcome. Hu Ge and Jet Li is a no brainier. Hu Ge was in the film 1911, led by Jackie Chan, who co-lead the film The Forbidden Kingdom alongside Jet Li. Joo Won stars in Fashion King with Choi Sulli who plays his secret admirer, Sulli is an ex member of f(x), f(x) consisted of 5 members including Krystal Jung who starred in My Lovely Girl with Bi Rain, who was the leading actor in the movie For Love or Money with Crystal Liu, who was in The Forbidden Kingdom with Jackie Chan, who produced the drama version of his popular movie The Myth that stars Hu Ge. Shucks I'm sorry, your comment was mistakenly tagged as spam for some reason. I'm not as updated with Chinese films, didn't even know there's a movie with Jackie Chan and Hu Ge.